Please visit the new ROCKSTAR DIPLOMAT webpage for new updates! 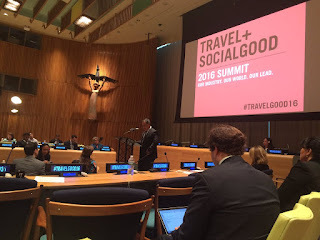 Last Friday I attended Travel + Social Good's 2016 Summit, which brought together tourism professionals, UN ambassadors and academics on the topic of mainstreaming sustainable tourism. The day before the summit, all attendees where invited on complimentary "Experiential Neighborhood" tours by sustainable tourism companies operating in NYC. I opted for a walking tour of the Lower East Side, which was sponsored by Visit.org, which empowers travelers to "never be a tourist again" by connecting them to "off the beaten-path adventures" managed with an emphasis on sustainability. Despite having lived in New York for a couple years, I was fascinated with the neighborhood quirks our guide told us about as we explored parts of Manhattan I had never even heard of. That night, the Summit's kickoff party was at Hostelling International's Victorian Mansion on the Upper West Side, which has more than 700 beds! I hadn't previously realized that HI was a nonprofit with a plethora of mission driven programs to help local and international youths become Global Citizens. 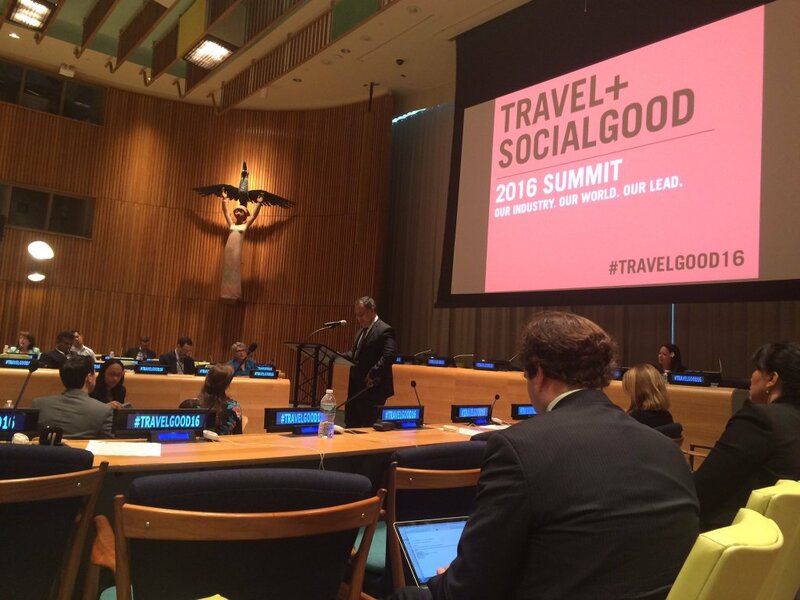 The next day, we gathered at a meeting room at the United Nations to hear a dozen presenters on a variety of topics. Some presenter highlights: Former VP of the Ritz Carlton spoke of the need for greater collaboration between tour industry professionals and the publics. Dr. Martha Honey of The Center For Responsible Travel talked about how Ecotourism has evolved from a niche market to growing 3 times faster than conventional tourism. The Ambassadors of the countries Tuvalu and Samoa gave impassioned speeches about their danger to Pacific Island states in the face of climate change. Tuvalu's Ambassador Celebrity photographer Jeremy Cowart talked about his latest project, The Purpose Hotel. Barry Sternlict, founder of Starwood Capital and Hotels, introduced 1Hotels, "the first mission driven luxury hotel brand" and promised that guests would be exempt from having to "eat carrots and sleep in burlap." After lunch, we began a design thinking session aimed at finding solutions for making sustainable tourism more mainstream. We were divided into groups and given the task of developing a new tourist product based off of the needs of a hypothetical ideal client base. Within my group discussion, it was fascinating to hear about tourism trends from both the luxury and the backpacker backgrounds seeking out more authentic cultural experiences and both favoring sustainability in some instances. I gave a quick presentation of my group's pitch, which was a social networking service for business travelers looking to connect with other industry professionals. I met some great people in the tourism biz there and look forward to attending next year. With warmer weather beckoning to outdoor activities I always look forward to the live music in Central Park and Prospect Park that begins in late May. For one of the first SummerStage perfomances of this year, it was Portugal the Man and Cage the Elephant. It was a bit windy during the show and the sound guys had some problems getting the sound right. At most outdoor shows I think the sound guys just blast the lows and highs but there are definitely regulations against doing so given the amount of residential buildings closeby. The sound got better for Cage the Elephant, who strongly resembled the British Invasion groups of the Sixties and Seventies despite being from Knoxville, TN. Their singer was one of the most energetic frontmen I'd seen in a while, resembling a young Mick Jagger at times. Take a look. Their songs were a bit ecletic, the majority sounding like Sixties revival songs but a few sounded very Nineties like the Weezer-esque song above. They had an Oasis-sounding song as well as one that sounded just like their opener, Portugal the Man. On Sunday I went to the 35th Annual Sakura Matsuri (Cherry Blossom) festival at the Brooklyn Botanical Gardens. As cherry trees have held cultural significance for both the U.S. and Japan, both countries have used "Cherry Diplomacy" to promote values and maintain relations abroad. The festival on Sunday was an opportunity for Americans interested in Japanese culture to check out activities including tea ceremonies, manga drawing, origami, traditional dance, drumming, theatre, martial arts, visual arts and even stand up comedy. The event meshed well with the permanent installations of Japanese cherry trees, bonsai tree collection and Japanese-style garden and pond that have been fixtures at the Botanical Gardens for years. What caught my eye were the large numbers of youngsters, Japanese and American who had showed up dressed like their favorite anime characters. 1 out of every 6 people I saw at the festival was "cosplaying" the likenesses of Dragon Ball Z, Cowboy Bebop, Sailor Moon, Spirited Away and more. Looking at the program, I was shocked to see that there was no costume contest and these people had dressed up on their own, Gothamist got some great photos last year. Concessions also featured bento boxes with teriyaki and sushi rolls which you could wash down with a frosty Kirin Ichiban beer. I finally got a chance to taste one of the most popular eats in New York right now: Okonomiyaki. 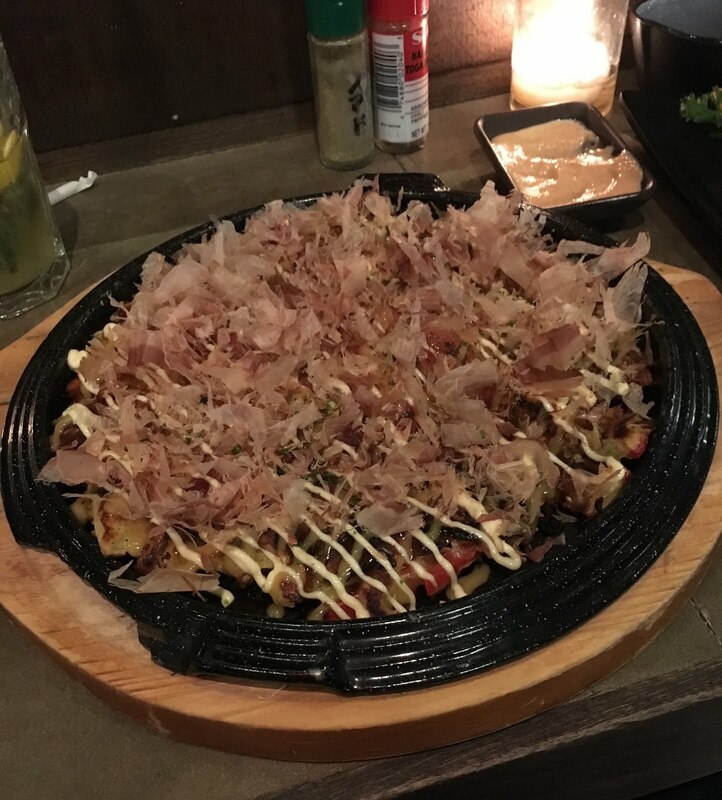 Originating from Okinawa, Japan, it's a flour pancake with meat/seafood, scallions, veg and sometimes cheese, topped with shredded bonito fish that dances around on the hot plate when it is served. The pancake was bursting with flavor (the extra sauces were a bit much!) and I wished I'd had an ice-cold beer to wash it down. We sat at the bar at Izakaya Nomad and watched the chefs prepping tataki over a grill that they occasionally seasoned with a big slab of fat. Of special mention were the purple sweet potato fries that were in a lighter-than-tempura batter and came with a mentaiko aioli that had been blended with marinated cod roe, really unique. Afterward, we rode our bikes a mile South to Small's Jazz Club in the Village where we arrived just in time for the 7:30 set. Fukushi Tanaika, one of the most well-known contemporary Japanese jazz artists, was on the skins with his quartet. Joining him were his countryman Hide Tanaka on bass, Texan Marc Devine on piano and Seattlelite Chris Johansen on tenor sax. Their set was an impromptu tribute to Hank Mobley, a tenor sax composer well known for hard bop and soul jazz. The venue is a basement with a small bar and a couple mirrors allowing you to see behind the musicians. The intimate setting was perfect for the quartet, who got everybody in the joint jumpin' to the beat. It was incredible to have Fukushi gush about how big of an influence Hank Mobley was for himself and Hide while they were growing up in Japan. The existence of the Fukushi Tanaika quartet had to certainly be influenced by some of the U.S. Jazz Diplomacy and VOA Radio that disseminated the uniquely American music around the world during the Cold War years. Just saw this article in the New Yorker about how Chef Rene Redzepi, founder of the top-rated restaurant in the world, started a restauarant with an NGO in La Paz, Bolivia. It combines culinary diplomacy with a seemingly functional two-way development model. "Meyer realized that their strategy was flawed: they could not run an ambitious restaurant and teach staff members the rudiments of kitchen work at the same time. He devised a two-tiered system for training employees. Melting Pot would start a network of entry-level cooking schools in El Alto, where their students lived. The top graduates would be eligible for scholarships to continue their studies at Gustu." Spending time in Colombia's major cities, or even smaller towns within the third of the country that is home to most of the country's population, one can easily become disconnected with the reality that other parts of the country still suffer from armed conflict. A recent show of force by the Urabeños, a neo-paramilary group linked to drug smuggling, shut down the entire Caribbean coastal region of Colombia across 7 departments. This "Paro Armado" (armed strike), effectively turned the areas into ghost towns and targeted members of the Colombian police and military, killing 3. The incident brought me back to the Paro Armado we experienced in 2011 in the tiny resort town of Sapzurro, on the border with Panama. After a couple lovely days laying on the beach, we heard there would be a Paro Armado, affecting the entire coastal region of Colombia. Colombian military had killed a high ranking member of the Urabeños group, prompting an armed strike for the day he was to be laid to rest. Despite being the most far flung of Colombian coastal towns, Sapzurro's population of 270 were nowhere to be found during the strike. The military police that had hung around the boat launch daily did not show up for work that day. We walked by the restaurant where we had made reservations for that evening, which was shuttered and had a sign saying it was closed. We called the restaurant from our hostel and they gave us specific instructions for that night. We came back at sunset and knocked on the door of the neighboring house, which let us in and led us through their living area to the dining room of the restaurant. The windows were tightly shuttered and a couple families were quietly eating by candlelight. Palpable tension permeated the entire experience as someone came and knocked on the front door, startling our waiter (it was just another hungry diner), who spoke in whispers throughout the meal. The fish was amazing, as expected and we left a hefty tip for our friends who kept us from going hungry during the armed strike.